BELIZE CITY, Wed. June 24, 2015–Belize has ranked fifth among 145 countries in the 2014 Country Well-Being Rankings by Gallup, an American research-based, global performance-management consulting company, which indicates, based on Gallup surveys, that 38.9% of Belizeans are thriving in at least three of five elements: purpose, social, financial, community and physical. 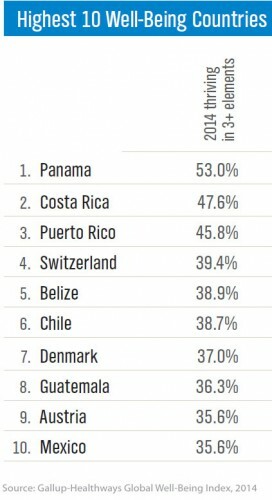 For the second year, Panama leads all other countries in well-being, with 53% of its residents thriving in three or more elements, while Afghanistan ranks last with 0% of Afghans thriving in three or more elements. Gallup said that its research included more than 146,000 surveys in 145 countries and areas, and captures how people feel about and experience their daily lives. Of note is that while Belize ranked among the top ten for four of the five indicators, it was ranked #73 for the financial indicator, which indicates that more people are “struggling” or “suffering” on this front than in the other categories. In the just released rankings, the United States has slipped in its global ranking from 12 to 23. While the US scored a financial ranking of 22—far better than Belize—it was ranked worse than Belize on the other four fronts. According to the Gallup report, only 17% of people globally are thriving in at least three elements, with those living in the Americas ranking the highest (with 31%) and those living in sub-Saharan Africa ranking the lowest (with 10%). “The fact that only 17% of the world’s population is thriving in three or more elements of well-being represents a huge opportunity for country and community leaders, employers, insurers and any population health stakeholder. There are proven interventions that these leaders can and should leverage to improve the health and well-being of their populations and, at the same time, create measurable economic value,” said Peter Choueiri, president of Healthways International. “The state of a country’s well-being sheds light on levels of prosperity and progress. Government and community leaders globally have a duty to improve the lives of the people within their borders. Other stakeholders, such as employers, health plan providers, and educators are also focusing on improving the well-being of the populations they serve. Our research provides critical information these leaders and stakeholders need to help guide policies, interventions and development investments for community transformation and real-life behavior change,” the 2014 report said.